King Mohammed VI of Morocco has underlined the need to speed up the proposals put forward part of his calls to reconsider the country’s development model and to devise a new approach to help address the needs of citizens, while showing a genuine sense of patriotism. This would “enable us to reduce gaps and disparities, achieve social and spatial justice and keep up with changes at home and abroad,” said King Mohammed VI Friday. 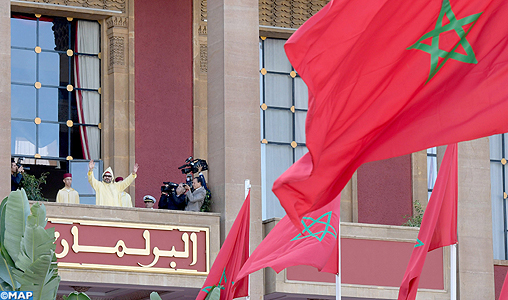 “Morocco must be a country of opportunity, not of opportunists. All citizens, without exception, should be given the same chance to serve their country, and all citizens must benefit, on an equal footing, from the country’s resources and from opportunities for growth and advancement,” he insisted. “More than ever, Morocco needs true patriots who have the homeland’s interests at heart, who care about the citizens and who seek to bring Moroccans together rather than divide them; it needs honest officials who shoulder their responsibility with dedication and selflessness,” he said, alluding to irresponsible officials and PMs who only seek to serve their own interests. Urging MPs, cabinet members and other senior officials to rise to the occasion, he said this requires a genuine sense of patriotism, collective mobilization and a clear will to put the homeland and the citizens above all else. The King who recalled the initiatives and reforms launched to pave the way for future action and create fresh momentum, laid a special emphasis on issues that he deems “urgent” and that cannot stand any procrastination, such as education and training, employment and youth issues, public support and social protection. King Mohammed VI also dwelt in his speech on vocational training as it is a powerful lever for employment, stressing the necessity “to work on creating more bridges and links between vocational training programs and general education courses within a unified, integrated system”. “There should also be a balance between theoretical training, on the one hand, and practical, workplace training, on the other,” he stated before noting that there are a number of sectors which can contribute to creating more job opportunities. In this connection, he mentioned the agricultural sector that can constitute a more dynamic source of employment opportunities and be instrumental in improving living conditions and consolidating stability in rural areas. “I therefore urge the government to come up with innovative mechanisms in order to continue incentivizing farmers to become more actively involved in productive agricultural cooperatives and groupings, and to seek training in the agricultural field”, said the Monarch. He also called for improved access to land, making it more easily available to investors in a bid to increase production, boost productivity and stimulate employment. To create more jobs, “we should consider the possibility of having quality initiatives and global leaders involved in some sectors and professions – such as the health care sector – which are not currently accessible to foreigners, provided the said projects contribute to the transfer of know-how and create employment opportunities for young Moroccans with the right qualifications”, the Sovereign said further. Dealing with public support and social protection, he called for the implementation of effective social policies and the promotion of solidarity-based initiatives at various levels. To this end, regulations must be simplified in order to encourage various forms of donation, volunteer work and charity, and to support social initiatives and socially responsible businesses, said the Moroccan Monarch, noting that new mechanisms should also be put in place to engage the private sector in tackling social issues and contributing to better services to citizens.